On May 7th hordes of citizens all over the country strode to their various polling stations to make their mark on history. There was much conjecture prior to the general election with many predicting a hung parliament and the SNP getting into bed with Labour leaving the Conservative LibDem coalition in tatters. UKIP had also been creating a stir with their nationalist prattle. It surprised us all when Cameron surged in front and just made it over the line for a majority win, only to set in motion a domino effect of political leaders handing in resignations and limping off the pitch with head in hands! The Financial Times put their own spin on the conjecture before polling day with a fantastic Coffee Cup campaign in the City. 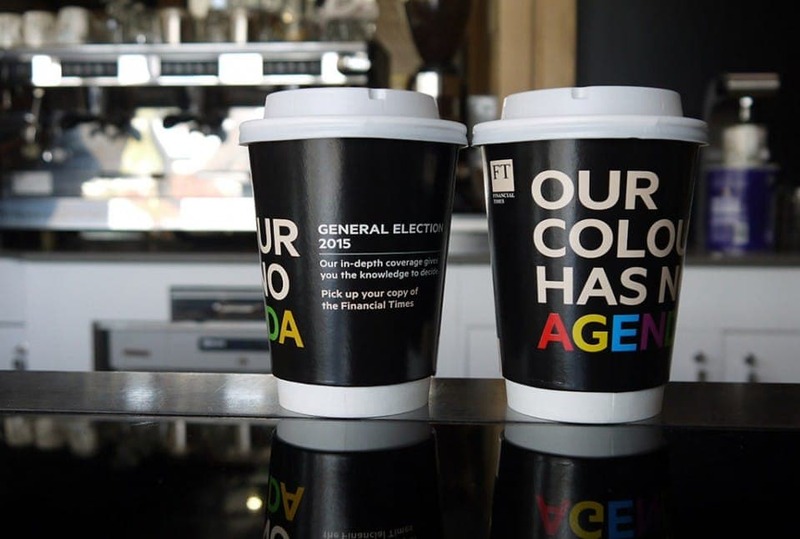 Reminding their key business audience about their in-depth coverage of the general election, the strapline reads ‘Our Colour Has No Agenda’ and encourages consumers grabbing their morning coffee to pick up their copy of the Financial Times. The campaign ran from 27th April for a period of 2 weeks.